Pantomime Productions' preschool focused production of Goldilocks. Pantomime Productions is a delightful ensemble of people with a passion to perform and engage with a young audience. 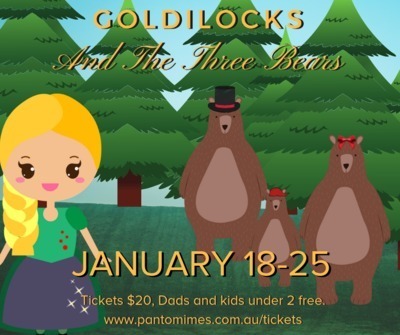 Miss 3 and I were kindly invited back to attend this summer's production of Goldilocks; a preschool focused performance, which had the audience actively singing and joining in. With local references and the actors coming out into the audience for a teddy bears picnic, Miss 3 and I felt very much part of the action. Miss 3, along with other little members of the audience, even ended up on stage singing "If you happy and you know it." We left Malvern East with a heart-warming smile. 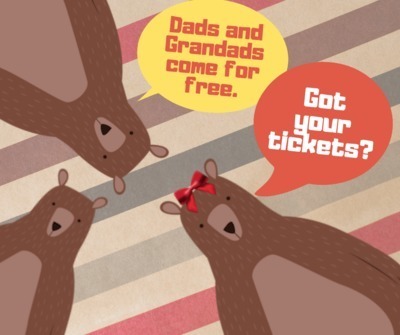 Tickets are only $20 per person and Pantomime Productions have introduced another incredible special offer: Dads and Grandads (and kids under 2yrs) enter free of charge (note that free tickets may only be claimed with the purchase of a full price ticket). Make a note in your diaries and stay tuned to Pantomime Productions' website to book tickets for the performances ahead.